Living a Fit and Full Life: Get the Cleanest Floors Ever with Kärcher's NEW FC 5 Hard Floor Cleaner! Get the Cleanest Floors Ever with Kärcher's NEW FC 5 Hard Floor Cleaner! 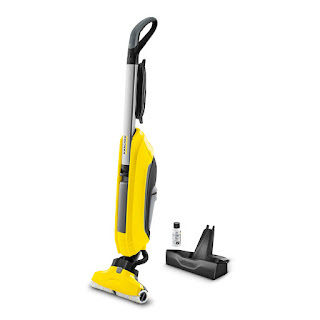 The Floor Cleaner FC 5's two-in-one function lets you mop and suction wet and dry dirt in just one step. No need to vacuum beforehand – mopping has never been easier, faster or more thorough. The automatically moistened, rotating microfiber rollers pick dirt up, while the water-dirt mixture is continuously suctioned off the rollers at the same time. This practical self-cleaning function keeps the rollers fresh and ready to use at all times. 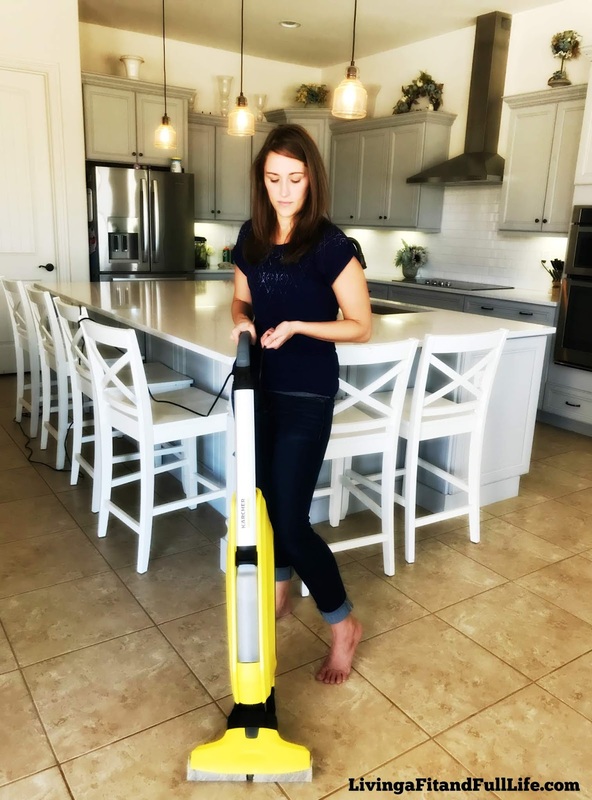 Iin comparison with conventional methods like mopping, the FC 5 uses up to 85% less water while providing significantly better cleaning performance. The FC 5 can be used on all standard hard floors, whether they are made of wood, stone or plastic. It can also be used to easily apply a thin layer of polish that dries quickly, leaving your floors shining and freshly cleaned. No need to interrupt your work. The FC5 automatically removes dirt, liquids and debris from the rollers. Floors dry in less than 2 minutes thanks to the minimal amount of water or cleaning fluid left behind. The rollers can be quickly and easily attached or removed. Machine washable up to 140 degrees Fahrenheit. The forward rotating rollers help to propel the FC5 across the floor, you only need to guide it. Cleans right up to the edge – for excellent results in corners and on edges. The clean water tank can be easily filled from a faucet. The dirty water tank can be emptied without coming into contact with the dirty water or cleaning solution. The storage station is perfect for cleaning dirty rollers. A convenient and space-saving to store the FC5 when not in use. Get the cleanest floors ever with Kärcher's new FC 5 Hard Floor Cleaner! I'm kind of a weirdo in that I've always enjoyed cleaning my floors, but one thing I don't enjoy is cleaning only to have my floors feel dirty when I walk on them. This has been the case so many times. I spend hours sweeping and mopping only to still be able to feel dirt when I walk barefoot on my tile floors. Another thing that has really been bugging my lately is how dirty the grout between my tile has started looking. Now if you think about it, you really can never get a true clean floor with a mop because you're just pushing that dirt around. Unless you clean your mop after every stroke the dirt is just being moved around. For me, I've come to the conclusion that most of that dirt has been getting pushed and stuck into the grout of the tile. 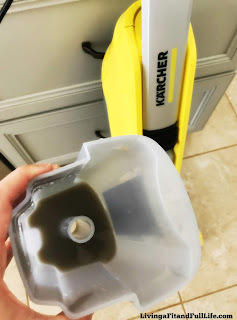 I've just recently discovered Kärcher's new FC 5 Hard Floor Cleaner and I have to tell you that I'm immensely impressed! I have tile floors in about half my home and after just one cleaning my floors not only looked clean but there wasn't a speck of dirt to be felt when I did the barefoot test. That's pretty impressive, especially because right now my backyard is being landscaped and there's dust and dirt everywhere. Another thing that impressed me was that the grout actually looked cleaner as well. The dirty water that poured out of the dirty water tank was as dirty as could be and my floors never looked or felt cleaner! Very dirty water = Clean floors! Kärcher's new FC 5 Hard Floor Cleaner is extremely easy to use and will have you wondering why you ever even used a mop in the first place! It actually vacuums and mops so there's no need to even sweep your floors before mopping so you'll save tons of time. Kärcher's new FC 5 Hard Floor Cleaner automatically removes dirt, liquids and debris from the rollers so you're always cleaning with clean rollers for amazing results. The FC 5 also has forward rotating rollers that help propel it across the floor so there's very little work on your part, since all you need to do is guide it. The rollers are machine washable when your done cleaning and the easy-to-remove two tank system allows you to have one tank for clean water and one for dirty water. Kärcher's new FC 5 Hard Floor Cleaner even comes with a storage station to keep your FC 5 neatly stored when not in use. Kärcher's new FC 5 Hard Floor Cleaner is a must have in floor cleaning and I highly recommend it!